Calhoun's VP Series building is ideal for waste and recycling applications. According to Calhoun's marketing manager, Deanna Hope, 2018 was a banner year for the Tara, Ontario based firm, in terms of surpassing goals, exponential growth and the calibre of projects successfully completed. Calhoun designs, engineers, and manufactures fabric structures for any industry and application, up to 250 feet wide and for any length. The company also has an extensive dealer network across North America to locally serve valued customers in key industries including waste and recycling, composting, municipal applications, mining, construction and oil and gas, as well as sports and recreation, equestrian, agriculture and warehousing. Hope says the firm's dedicated team of expert engineers applies a unique 3D Nonlinear Finite Element Analysis to custom- engineer their structures, and hot-dip galvanize their steel framework to protect fabric structures from corrosion. "Every building produced by Calhoun Super Structure undergoes a vigorous site-specific review," said Hope. "We believe this is the only way to ensure our customers receive the most efficient and reliable structure on the market. For example, careful review of the building usage is needed to ensure the correct application-related parameters are selected for the design. Buildings in low hazard applications are not required to have the same reliability as buildings occupied by people." 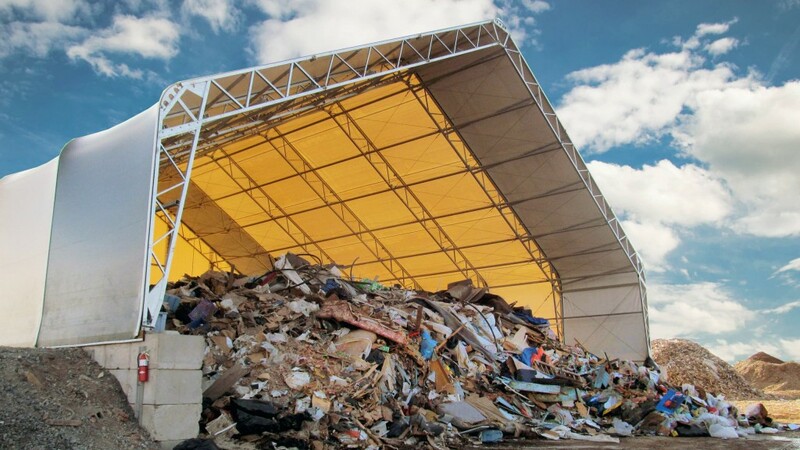 "In assessing loads, our engineers consider the probability of the roof becoming sheltered by adjacent structures or trees. Such changes could cause either higher-average loads or drift loads. Wind effects in built-up urban environments require detailed review by experienced engineers to ensure they are correctly evaluated. The enclosure of a building also plays a significant role in the demand on the structure. Our entire process is quite involved and should only be left to our most experienced engineer professionals." "As an industry leader, our vision and subsequent mission is to be the safest, most reliable, and durable fabric structure, leveraging years of benchmark engineering and exceptional service. We reinforce our aims by tying it back to our goals, making our statements visible throughout our offices and website, and continually share customer success stories that recognize the core ideology of what we stand for - safety, reliability, and longevity." Discussing the firm's success over the past 12 months, Deanna adds that the company has come far thanks to its customer-focused approach and commitment to innovation. "Success is an evolving thing, and it takes the right combination of people, process, patience, and proactivity to continually strive for it. This past year has been a banner year for Calhoun in terms of surpassing goals, exponential growth, and the calibre of projects we have successfully completed for our customers. It truly is an honour to be recognized for that, and it truly would not have been possible without the dedication of our team and partners." "Moving forward, we look to further expand our reach into untapped industries and markets by offering new products and expanding our dealer network. To prepare for added growth, we are implementing new tools to speed up our process and become more efficient. "The upgrades will allow us to know what is happening on the manufacturing floor at all times, shortening our lead times and allowing us to provide more accurate delivery expectations to our customers." Calhoun's CC Series building in a waste application.